You’d think computers would be naturally pretty good at videogames – they run the things, after all, so they know all the rules. But it turns out, teaching a machine to play games designed for humans is pretty complicated. 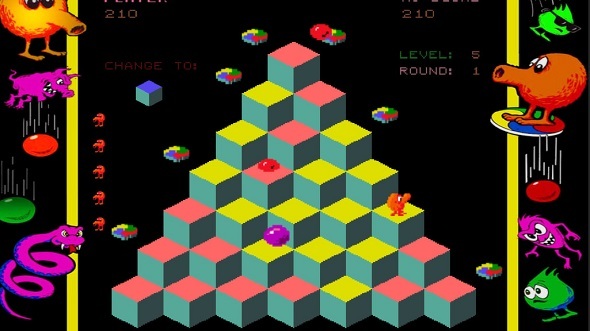 And when you do, strange things can happen – even in a game as simple as Q*bert. Check out our list of the best classic games still worth playing on the PC. The Verge reports on a team of researchers at the University of Freiburg in Germany who have been teaching AIs to play 1980s Atari games. They’re studying a kind of AI that uses what’s called “evolutionary algorithms” as a form of machine learning, and testing the results by having algorithms attempt to play through simple videogames. Versions of the algorithm that do well are kept, while others are discarded, with tweaks made to the remaining set to see if they can improve their results. You can watch the video above. When Q*bert designer Warren Davis saw it on Twitter, he said it doesn’t look like something possible in the original arcade version of his game. It’s likely a quirk specific to either the emulator or the port of Q*bert used in the study. The AI, of course, wasn’t particularly interested in whether the game it was playing was an authentic reproduction, it was just out to score points. And, hey, fair play.